Question: How do you know Australia have been eliminated from an ICC tournament? 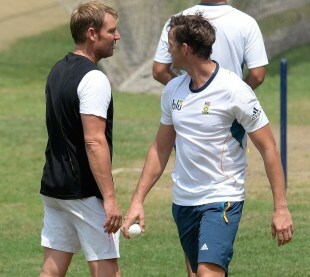 Answer: Shane Warne turns up at the nets of another team. Warne, who is in Dhaka on commentary duty, was on hand to observe and offer a few thoughts to South Africa's players ahead of their World T20 semi-final against India on Friday. Having helped plot the downfall of South Africa's Test team ahead of the decisive third match against Australia in Cape Town, it seemed only fair that Warne would offer some balancing advice this time around. Imran Tahir was a particularly interested pupil, taking notes on legspin ahead of what is likely to be his greatest challenge of the tournament against batsmen amply gifted against spin. The outing was not entirely straightforward for Warne, who after training had some difficulty locating the whereabouts of the car he had arrived in. South Africa's players engaged in some mixing of a different kind on Wednesday evening, taking part in a shared men's and women's team dinner in Dhaka. Both sides have been successful in reaching the semi-finals: the women are facing off against England hours before the men tackle India. In the aftermath of West Indies' victory over Pakistan to seal a semi-final berth, Dwayne Bravo spoke of why the celebrations had been somewhat muted compared to those for the win over Australia that preceded it. As many might have guessed, it was all about respect, and Bravo's words will not be lost on the Australians as they settle back in at home. "Australia was a bit heated for us and I'm sure you know why. That was a very important game for us and we wanted to prove to ourselves and prove a point to the Australians that at the end of the day, we're all cricketers, all human beings, we play this game, we should respect each other, we're soon going to finish and cricket's going to go on. It's important that we leave our legacy as players, not only West Indian players but cricketers. We have young kids looking up to us, so I don't see the sense in trying to sledge the opposition, that actually gets us going. West Indies is a team that you should try not to upset, we don't step on anyone, we play hard, we play with a smile on our face, we compete fairly, whether we win or lose it doesn't matter, as long as we have a good game. The Australians, they just deserve what they get." Ricky Ponting was no great Twenty20 expert, and has freely admitted that Australia took a long time to invest serious time and thought into the format when he was captain. However his views on England's poor tournament are worth noting for their simplicity: no Kevin Pietersen, no chance. Ponting also said that it felt as though the ECB were looking for a chance to cut ties with Pietersen, something he offered with a recent downturn in his batting form. "They made a big call, there would have been a lot of thinking and a lot of evidence, I guess, into them making that decision because to cut your best player out of all forms of cricket for England is such a big decision to make," Ponting told Sky Sports. "But they've obviously got their reasons for doing that. "I'm pretty sure, though, that if Kevin Pietersen had been playing the way he was 12 months before that he'd still be in the England side - I think that's the bottom line. It was almost like there was an opportunity there, because he wasn't scoring the runs that he had been scoring that they could leave him out of the side."